The incident happened on Cumbrian Way, Peterlee. 'Image by Google Maps. A man has appeared in court following a stabbing near Peterlee town centre. Durham Constabulary have confirmed that a man was taken to hospital with stab wounds following the incident which happened on Cumbrian Way, on Saturday, January 19, at around 4pm. The victim was taken to James Cook University Hospital in Middlesbrough, with non life-threatening injuries and has since been released. A 46-year-old man police have named as Robert Tempest, of Galloway Road, Peterlee, has appeared at Newton Aycliffe Magistrates court on Monday, charged with the possession of an offensive weapon in a public place, threats to kill and wounding with intent. Officers have said it was an isolated incident. A spokeswoman for the force said: "A man has been charged following a stabbing in Peterlee over the weekend. "The incident happened on Saturday afternoon on Cumbrian Way at around 4pm. 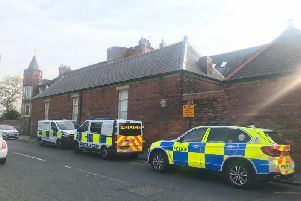 "A man was taken to hospital with stab wounds but these are not believed to be life threatening, he has since been released from James Cook Hospital in Middlesbrough. "A 46-year-old man has been charged with the possession of an offensive weapon in a public place, threats to kill and wounding with intent and will appear at Newton Aycliffe Magistrates court this morning. "Officers would like to reassure local residents that this was an isolated incident."